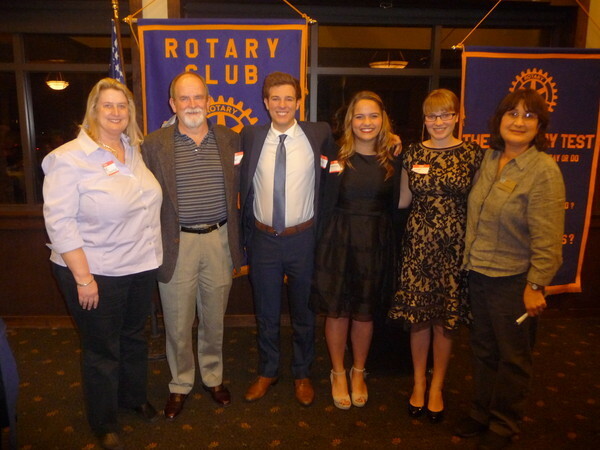 L-R: Judges Roz Westra and Peter Hornby, contest winners Daniel Bondi, Annie Pfost, Madison Roush and Rotary Club president Carol Daderian. Credit Penny Arévalo. For the first time in school history, JSerra was invited to participate in the Rotary Vocal Competition and JSerra could not be more proud of the performers. Congratulations to JSerra senior Daniel Bondi, and junior Annie Pfost for their accomplishments at the annual competition. Song contest winners from San Juan high schools were selected at San Juan Capistrano Rotary Club’s annual song competition on Wednesday Feb. 22 at San Juan Hills Golf Club. From a field of 17 entrants, first place went to JSerra Catholic High School senior Daniel Bondi, singing “Me!” from Beauty & The Beast. Also from JSerra Catholic High School, second place went to junior Annie Pfost, singing “I Dreamed a Dream” from Les Misérables. “Four of our own students, Victoria Moyzis, Matthew Chamberlain, Annie Pfost and Daniel Bondi went up against 14 others and we walked away with first and second place,” said Brian Dehn, JSerra Choral Director. “Not only did we present ourselves extremely well with taking the top two spots, we also were commended for our professionalism and maturity. JSerra was well represented and the parents, fellow vocal coaches and I could not be more proud of these four talented students.